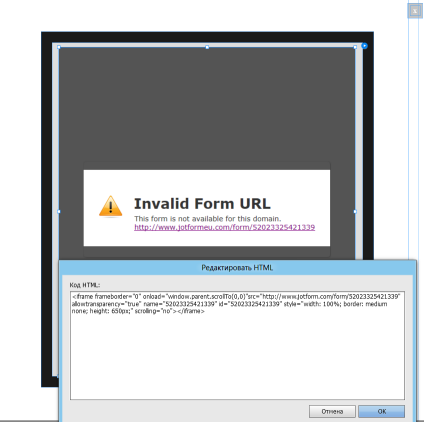 How to insert a form in the lightbox in Adobe muse? the program she runs at startup on the site shows a blank window or a custom error ????? The code that you are asking about, onload="window.parent.scrollTo(0,0)", is to ensure that your browser will scroll back up when you change the page inside the iframe. For example, when you have scrolled down a very long form, and clicked on Submit. Inside the iFrame, the Thank You page will load instead of the form you have filled. This code makes sure that your browser scrolls to top, so that you can see the Thank You page. When it comes to embedding your form to Adobe Muse. I see that you still have the old Lightbox code that you've tried embedding, as well as the iframe code. Please kindly remove all the embed codes you have added so far to your page.